OK.. my little MAO-ettes.. this one is almost too good to believe...but yes.. It's totally legit..and such a deal plus you get to help a great charity! There's this amazing charity called.. One Laptop Per Child (OLPC). Here's more about the OLPC charity. The charity's mission is to provide a means of learning, self-expression and exploration to the nearly 2 billion children of the developing world with little or no access to education. They look to provide a laptop to help connect and educate children...so what could be better then that?? Well.. how about also getting a one of a kind signed 11" x 14" color photo from one of America's most sought after photographers for just a $500 donation (aka.. a tax deduction).. ?? Actually it's a $400 donation and for $100, and you'll get a signed photo. FYI.. a typical editioned Catherine Opie photo of this print size would sell easily for over $3,000 in a gallery...plus these are all unique! Not bad! Here's more on Catherine Opie. 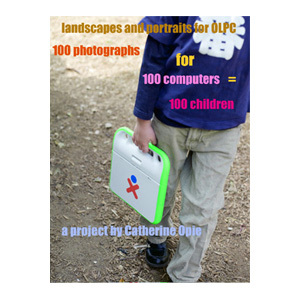 So Catherine Opie created a project of 100 images where she took photo's (both landscapes and portraits) of the artist's neighborhood of Los Angles and Three Rivers as a backdrop for the OLPC laptop. Dr. Quiz and I saw a few examples of the photo's at the Luminaire Studio during Art Basel.. they were all pretty cool. So, the only catch is you can't choose your exact image.. it's a surprise which one you'll get. First, you just have to register at this website.. and then you can make your $500 donation here, and you'll get your unique 11"X14" Catherine Opie photo. Then they send you an invoice.. your pay, and they send you the package with the Opie Photo. and tell them MAO sent you.. for more info on this Charity Print Offer. Looks like they've taken the edition down..
As of a few days ago.. only 5 or 6 were sold so far.. So I'm not sure what they are doing.. If I find out any info.. I'll post more.. Thanks for ruining Christmas. AGAIN! I almost fell for it too. MAO what happened? Too many bargains going on folks, need to be careful.During the holidays some people always try to take advantage. I spoke with the Luminaire People.. If you place and order..
And once you pay.. they send you the package with the photo. So does each of the photos have a OLPC laptop in it? While I love her photos I am not sure if I want a backdrop for an unattractive laptop. I'd love some more info on what you thought of the images. the few photo's we saw (only 3 or 4).. each had an OLPC somewhere in the image, generally in a childs hand or peaking out of a backback or something.. The photo's we saw were all taken outside..in an urban setting, with childern & an OLPC in the image. But I have no idea what the rest look like.. you could probably call or email the people at Luminaire to get more info. Yik. I think you should just donate the $400 for the kids and forget the photo. Although I'm sure we'll see them flogged on ebay. For those who are ungrateful and don't appreciate Mike's efforts, please check out ACRIA sale going on tomorrow at 230 West 38th Street between 12:00-5:00. The is a 15% discount going on. Don't be a Grinch or make other ones try to do good like one . Bad Karma. 15% off of our incredibly low everyday prices on our entire selection of artists’ limited edition and unique works! And enjoy delicious Holiday refreshments too!! renowned contemporary artists working today. The sale is for one week only so you better move fast! Sale ends December 19th at midnight and cannot be extended. before December 19th. And, remember, all ACRIA purchases are always SALES TAX FREE! Happy Holidays and thank you for supporting ACRIA!